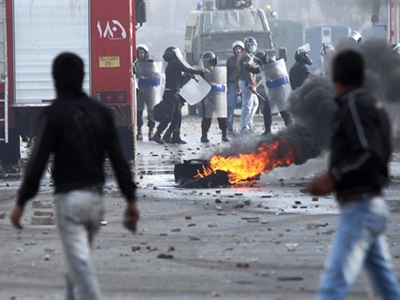 Egypt’s "Final Friday" did not meet the protesters’ expectations. 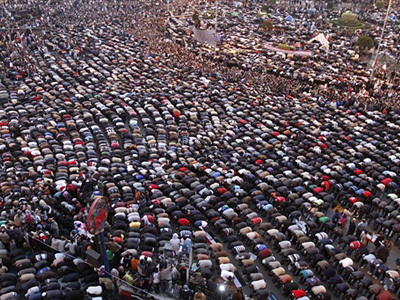 Over one million Egyptians gathered in Cairo's Tahrir Square on the 11th day of unrest, calling it "Final Friday." Thousands more protesters flooded the streets of Alexandria, Suez and other cities. Previously, President Hosni Mubarak said that he is only staying on to ensure a smooth transition of power. 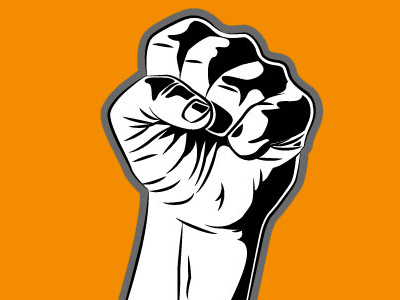 However, it did not seem very likely that his decision would do anything to quell the protests. People called February 4 “Final Friday,” “Fury Friday” and “Destination Friday.” They wanted this day to become the last of Mubarak’s office. The protestors, who had been camped out on Tahrir Square for more than a week, planned to march to the presidential palace. 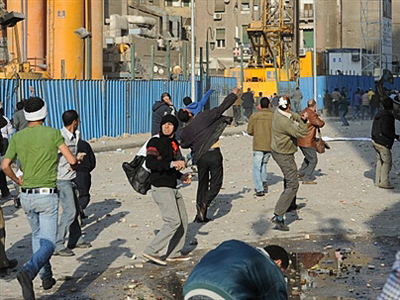 The stronghold of the protesters was on Tahrir Square, where they had barricaded themselves behind concrete slabs and blocks and from where they could work. However, the problem for them was that they needed to leave anyway for the march, and while leaving, they would be spreading themselves out quite thin. The road to the presidential palace was lined with soldiers and armored personnel vehicles – the army was in control of this route and it was anticipating that the march would take place. The protesters spent Thursday night on Tahrir Square. It was a night of relative calm, RT correspondent Paula Slier reported, but people had been encouraged to go to the square, and sporadic clashes did take place. On Friday, after the midday prayers ended and people started to mobilize, banners were flying and slogans were being shouted while people prepared to make their way to the presidential palace, the planned destination for the protest. Mubarak was holed up in the palace, and he had indicated that he was “fed up with the situation.” Despite that, he says he cannot step down immediately because Egypt will descend into chaos. Yet many Egyptians doubt the situation can be any more chaotic. The secretary general of the Arab League, Amr Moussa, addressed the protesters gathered in Tahrir Square. He said he might consider running in the upcoming elections. This announcement was met by great enthusiasm from the crowd. Egyptian Defense Minister Hussein Tantawi also visited the square and talked to the protesters. He was welcomed by the demonstrators, as it made them feel secure that the government and the army would not crack down against them. Tantawi is the most prominent government official to address the people in more than 10 days of the unprecedented demonstrations. Mohamed ElBaradei, the Egyptian Nobel peace laureate, on the other hand, has not been seen on the Square for several days, which leaves the open questions of who is leading the opposition. Only small scale clashes between Mubarak’s supporters and pro-democracy protesters were reported near Tahrir Square on Friday. 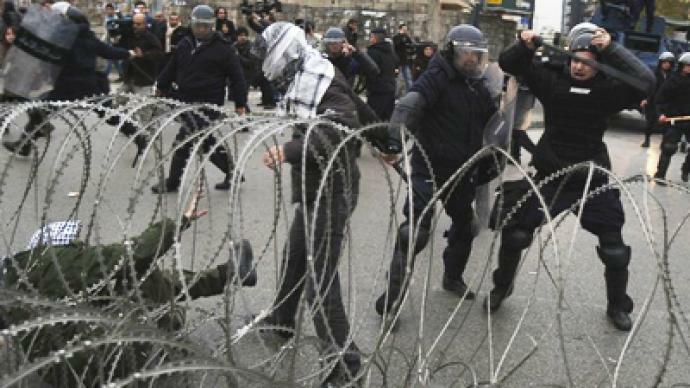 At least two people reportedly received injuries when the two groups started throwing stones at each other, the Associated Press reported. People were encouraged to go home, but thousands refused, saying they would stay until Mubarak steps down. 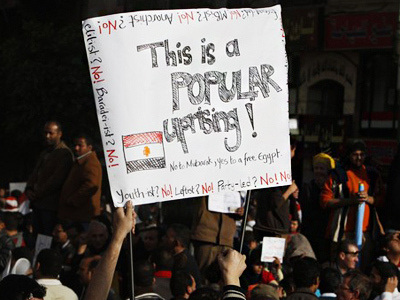 Protesters were disappointed that Mubarak did not address the nation on the day they had set as a deadline for his ouster. New banners have appeared calling on Mubarak to flee the country or even for Mubarak to be assassinated. Demonstrations are expected to continue. The army is still maintaining its presence on the perimeter of the Square. Soldiers are checking people’s IDs, making sure that nobody is carrying weapons, in order to prevent any more of the violence Cairo has seen over the past few days. There are increasing concerns in terms of the Islamist nature of the demonstrations. Some suggest that 50 percent to 60 percent of the people who gathered on the square are religious. The Muslim Brotherhood has denied that it is hijacking the demonstrations. 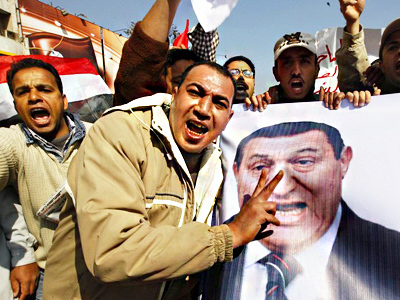 Mubarak has accused them of instigating the cause against him. “What happens next?” asked James Denselow, a writer on Middle East policy and security from King's College London. The intimidation of foreign journalists has increased as well, and a number of them have been beaten, arrested or detained recently. RT correspondents were among those who suffered injuries or simply experienced difficulties while trying to report from the scene. According to some sources, foreign journalists are deliberately being targeted while trying to cover the latest events in Egypt. Most countries have criticized the violence. The US and other Western governments have been very involved with the situation. The EU has been meeting in Brussels and issued a statement calling on Mubarak to step down as soon as possible and launch the process of democratic reform. The US is proposing that Egypt’s vice president, Omar Suleiman, head the interim government. The Egyptian people may or may not support the choice of Suleiman, but they are certainly in agreement that they do not wish developments to be dictated by anyone but Egyptians. See RT’s photo report from Cairo in the galleries section.